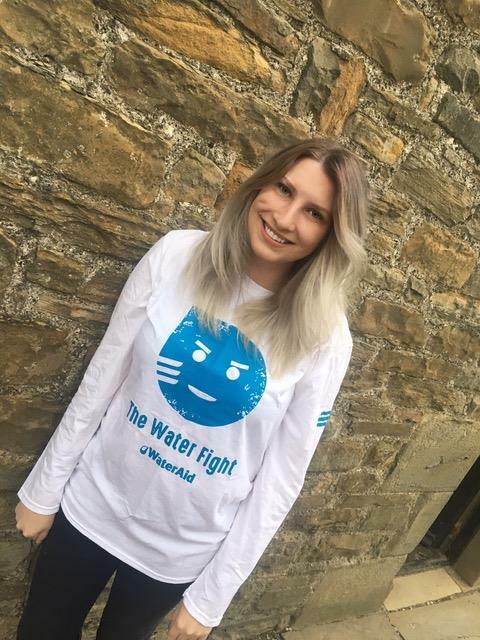 A Pendle YFC member from Lancashire will be hitch-hiking to Glastonbury Festival with WaterAid this June to rally support for the charity’s summer campaign, #TheWaterFight. Hannah Binns, 20, from Downham in Lancashire is hitching from Leeds University to Glastonbury to raise money for the charity and has already met her £250 target. While others will be bopping to Ed Sheeran and rocking to Radiohead at the Festival, Hannah will be working as a Loo Crew Team Member, cleaning the long-drop toilets around the festival site. She will be joined alongside an army of just under 500 dedicated WaterAid volunteers making a splash at Worthy Farm this year. Hannah has previously supported charities such as R.A.B.I (Royal Agricultural Benevolent Society) since becoming a part of Leeds RAG (Raise and Give) Society. Aside from working on the Loo Crew Team, Hannah and her fellow WaterAid volunteers are hoping to gather more than 40,000 signatures at Glastonbury for WaterAid’s new petition #TheWaterFight. The petition calls on the UK government to make sure that all government plans for schools globally include taps and toilets for every child. WaterAid volunteers will be giving out drinking water to festival-goers, collecting rubbish for recycling, manning the toilets, as well as helping manage the pilot scheme to introduce reusable stainless steel cups. Each WaterAid volunteer works shifts of four to six hours a day – the same amount of time many in the developing world spend collecting water, leaving little time for education. Globally 1 in 3 schools don’t have clean water or decent toilets. Without water and toilets, children get sick, miss lessons, or can’t concentrate in class. Girls drop out when their periods start. #TheWaterFight aims to change this by making clean water and decent toilets normal for every child. Without home comforts - whether queuing to get a drink, waiting to use the toilet, or not being as clean as they’d like to be - festival-goers can start to understand what it’s like for more than 650 million people living without clean water and the 2.4 billion people with nowhere safe to go to the toilet. You can follow Hannah’s experience at Glastonbury 2017 via her blog or on Twitter @_hannahbinns and you can donate to the cause here.